Dr. Calumpong with SU alumni from Artha Wacana who are presently teaching at the Faculty of Fisheries and Marine Sciences and Biology, except for Pablina Cadiz. L-R: Umbu Dawa, Anggreini Rupidara, Pablina Cadiz, Anne Rafael, Dr. Calumpong, Dr. Estacion, Clarissa Reboton, Alfred Kase. 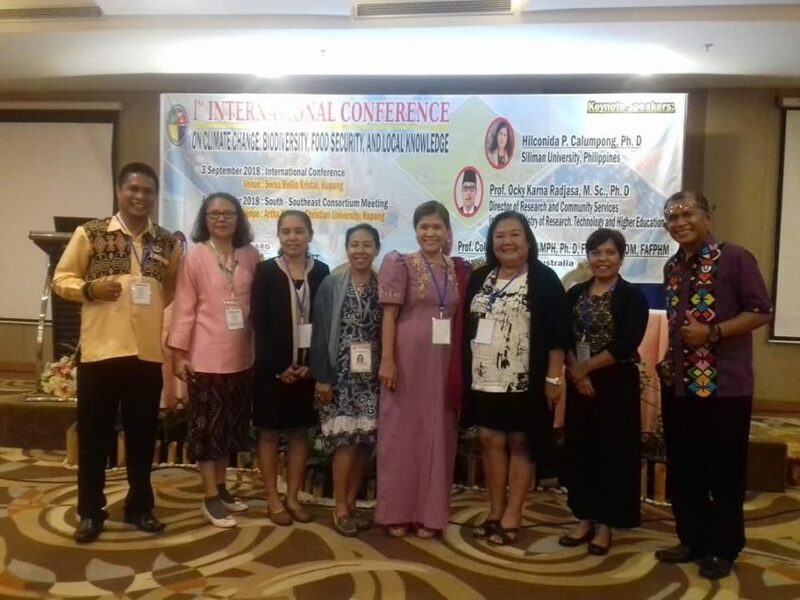 Three faculty members of the Institute of Environmental and Marine Sciences (IEMS) – Dr. Hilconida P. Calumpong, Dr. Janet Estacion, and Ms. Clarissa Reboton – participated in the 1st International Conference on Climate Change, Biodiversity, Food Security, and Local Knowledge held at Swiss Berlin Kristal Hotel in Kupang, West Nusa Tenggara, Indonesia on September 3. Dr. Calumpong was one of the keynote speakers. She spoke on the results of the World Ocean Assessment -1 with special reference to climate change and impacts while Dr. Estacion and Ms. Reboton presented papers on echiuran distribution and coral-eating snails, respectively. Ms. Reboton was awarded best paper presenter in the Biodiversity category. Also participating in the conference was Ms. Pablina Cadiz, staff at IEMS who presented a part of her dissertation on mangroves. Ms. Cadiz is currently on a Prince of Songkla scholarship, taking up Ph.D. in Environmental and Coastal Management. The Conference was hosted by Artha Wacana Christian University and sponsored by the United Board for Christian Higher Education in Asia. IEMS faculty with the Dean and the Faculty of Agricultural Technology, Soegijapranata Catholic University. L-R: Dr. Probo Y. Nugrgahedi (Dean), Ms. Clarissa Reboton, Dr. Hilconida Calumpong, Dr. Janet Estacion, Prof. Dr.Ir.Y. 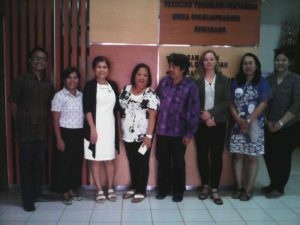 Budi Widianarko (Food Ecology and Safety), Dr. Ansje Lohr (Assoc Prof Env Sci, Open Universiteeit, The Netherlands), Ms. Inneke Hantoro. The three faculty members also visited Soegijapranata Catholic University (SCU) in Semarang where they met with former Rector Dr. Budi Widiniarko and the faculty of Agricultural Technology. SCU is the youngest member of the Regional Consortium on Coastal Resources Management.